By phone or e-mail. Please do not rely on Facebook for placing orders or asking questions. How far in advance should I order my cupcakes? Depending on when you will need your order, we ask for 24 - 48 hours notice. For larger orders, the more advanced notice you can give us, the better! Do you do custom orders/decorating? Generally, only for weddings. We will work with the bride and groom on colors, toppers, liners, and the look of the frosting. Other types of customization we handle on a case by case basis. Our cupcakes are best enjoyed the day of purchase at room temperature, but can keep up to 2 days in an airtight container. Cupcakes purchased from the refrigerated display should be kept in the fridge. If they are not consumed the day of purchase, please expect dryness to occur when storing in a refrigerator. IF NOT CONSUMING YOUR CUPCAKES THE DAY OF PURCHASE, THE BEST WAY TO KEEP THEM ABSOLUTELY​ MOIST IS TO FREEZE THEM. We sure do! Prices as stated on our Photo Gallery page. 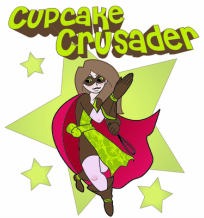 Additional fees for cupcake stand rental, custom cupcake toppers, and set up. Please feel free to call us, we will be happy to answer any of your questions! DO YOU RENT THE TRUCK FOR PRIVATE EVENTS? We'd love to bring our truck to your private party! The truck rents for $45 an hour plus the price of cupcakes. There is a minimum fee for cupcakes of $650, which is in addition to the truck rental fee. If the number of cupcakes ordered exceeds the $650 minimum fee, you will be charged accordingly, and not be charged the truck rental fee. 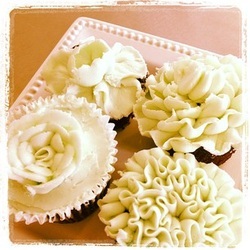 At the end of the agreed upon time, any cupcakes not immediately gobbled up by your excited guests are yours to keep! We will provide boxes for you to store them in.